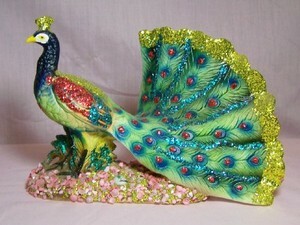 Now this peacock is bright and gllittery!! It is a souvenir from Florida I think, as it says Florida on the shells below him. It is decorated on both sides. The glitter is green, red & gold with pink shells at it's feet. Just a fun piece! !